Part human, part pig embryos have been successfully created by scientists for the first time. The embryos, that were grown inside a sow, contained a ‘low’ amount of human tissue. But it is hoped one day this technique will allow whole organs in the pig to be grown of human cells, to tackle the increasing shortage of organs for transplants. The ‘chimera’, or human-animal hybrid, was created by injecting human stem cells into pig embryos and then implanting them in a sow. The human stem cells grew and formed part of the tissue of the pig embryos, although they did not become piglets as they were removed at 28 days. The amount of human tissue that grew in the pig embryos was ‘low’, researchers said. Whole organs comprising entirely of human cells would need to be grown for use in transplantation. But it has been hailed as an important step in the way to the goal of one day growing human organs in pigs or other animals. It is hoped that one day this technique will allow whole organs in the pig to be grown of human cells, which will not be rejected by the intended recipient’s immune system. 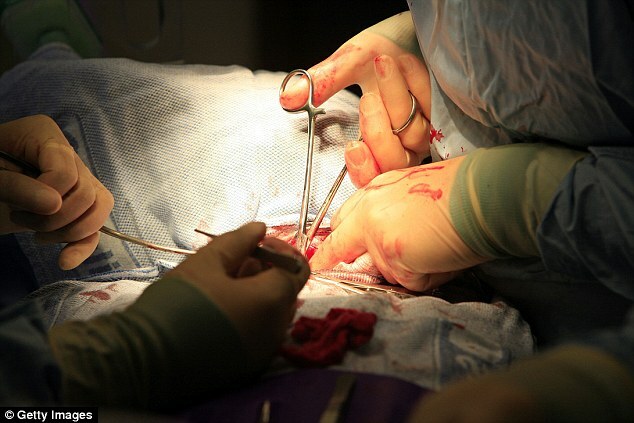 Around the world there is a desperate shortage of organs for transplant. Around three people a day die in the UK according to the NHS and 12 in the US because replacement organs cannot be found. The research raises ethical issues. If too much human DNA is introduced in a pig’s embryo, it could result in a pig with a ‘human brain’ – or a human face although as yet these concerns are a long way from being realised. 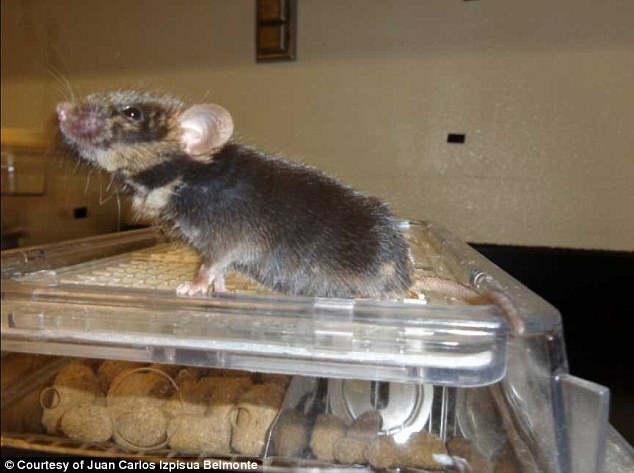 Dr David King, Director of Human Genetics Alert, the secular watchdog group, said: ‘I find these experiments disturbing. ‘In mythology human-animal chimeras were frightening monsters for good reason. I don’t recall these scientists asking for the public’s opinion before going ahead with such experiments. ‘I am concerned that human organs or tissues produced in pigs might carry pig viruses into the human population. The first scientifically published report of the creation of a human-pig ‘chimera’ appeared in the scientific journal Cell. An initial attempt to create a cow-human embryo was abandoned as the research effort was ‘more difficult and costly’. The research team from the Salk Institute of Biological Studies in San Diego and The Catholic University of Murcia in Spain said around 1,500 pig embryos had been used in the research, and it involved 40 people including pig farmers. The stem cells were harvested from skin taken from human baby boys who had undergone circumcision. One of the problems faced by the researchers is that pigs are five times more distant in evolutionary terms than mice and rats. Pig embryos develop three times faster than human embryos as well – so the different maturation rates also create a problem. Dr Izpisua Belmonte said that the human cells had to be injected into the pig embryo, which was grown in the laboratory at exactly the right time. ‘It’s as if the human cells were entering a freeway going faster than the normal freeway,’ says Izpisua Belmonte. Animals are seen as a way of growing organs because it has so far proven impossible to grow large three-dimensional organs outside of a living creature. As well as providing a potential source of organs for transplant, chimeras can be used in testing drugs. The researchers injected several different forms of human stem cells into pig embryos to see which would survive best. The cells that were found to survive longest, and had most potential were ‘intermediate’ human pluripotent stem cells. The researchers said the human cells survived and formed a human/pig chimera embryo. The level of contribution of human cells was low – which the researchers said was ‘good news’ as they did not want the pig embryos to develop human brains. Dr Izpisua said: ‘At this point, we wanted to know whether human cells can contribute at all to address the “yes or no” question’ he says. ‘Now that we know the answer is yes, our next challenge is to improve efficiency and guide the human cells into forming a particular organ in pigs. British researcher Professor Bruce Whitelaw, Interim Director of The Roslin Institute, and Professor of Animal Biotechnology, University of Edinburgh, said: ‘This is an exciting publication. 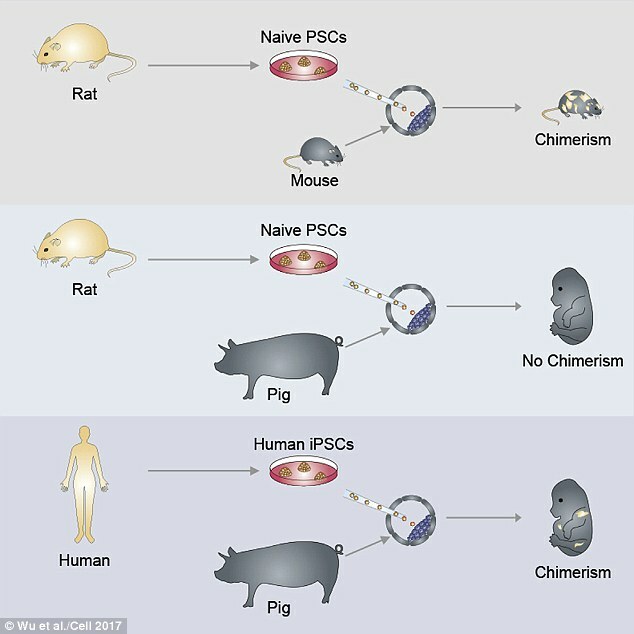 ‘It clearly demonstrates that human stem cells introduced into the early pig embryo can form a human-pig chimera. This is the first scientific publication to achieve this result. But Professor Robin Lovell-Badge, Group Leader, The Francis Crick Institute, said of the research was ‘although successful in places, it highlights several areas where it is clear that much more research is needed.